Search Elite will change your online business. Forever. The search marketing elite are gathering to deliver a conference that has one clear objective – to show you how to make significantly more money from your online business using clever SEM. 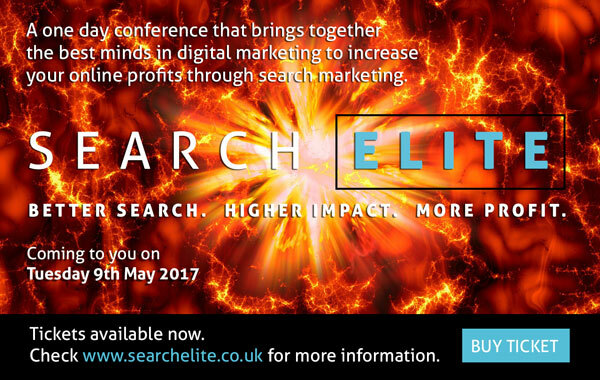 The Search Elite Conference has a lineup of speakers that have each led outstanding success in search marketing. If you are an in-house marketer, work for an agency, or if you are a digital marketing consultant then this is a conference which promises no fuss and no time wasting. Search Elite is about making more money for your business. Director Of Koozai and Search Personality Of The Year and Founder of State of Digital and Internationally renowned marketing specialist. Every speaker will be available throughout the day and at the after event drinks party to answer questions candidly and honestly about your business. Search Elite will be held on 9th May at The Trampery, Old Street EC1 – in the heart of London’s tech hub. Tickets available now. You’ll need some unwind time to let it all sink in, so after the event please join us for drinks and a few games of Ping Pong at the famous Bounce Bar next door, where we have our own special Search Elite area.